If you are running a website or you are thinking of starting one, then you understand the importance of having a great theme that will make your site stand out from the crowd. There is nothing quite like having a great-looking theme that is going to make your site look exactly the way you want. There are many providers who offer a wide range of great WordPress themes. Wplook.com is one of those providers who offer some of the best-designed, modern WordPress themes and plugins that fit almost all kinds of sites. From Designers to Developers, to Editors, to Web Design Companies to Non-Technical Users, Wplook.com offers over 15 complex WordPress themes tailored to satisfy the exact requirements of each user. In this review, I’ll take a look at some of the factors that set Wplook.com apart from other WordPress theme providers out there. So, let’s begin. Almost all reputable websites strive to achieve a simple, beautiful yet professional look. To attain such aesthetic excellence and still maintain your site’s performance requires a high quality theme. WPlook seems to take these factors in to consideration when they create their WordPress themes. The themes are well designed with a clean, elegant look that makes a website look great and professional. Whether it’s a business website, personal blog or a site for a web agency, WPlook offers professional looking themes that allows you to show case your brand in the best possible way. From a Laptop screen to a Tablet screen to a Mobile screen, the themes have been designed to have great responsiveness and as such, any theme you settle for will look awesome at any size. When it comes to website performance, Wplook has optimized their themes and code using the latest WordPress practices to ensure fast page-loading speed. Furthermore, each theme comes packaged with powerful features essential to creating a great website. One of the best features is the Page Speed Grade that is very useful when it comes to optimizing website speed. The shortcode plugin is another factor that makes WPlook stand out amongst its peers. 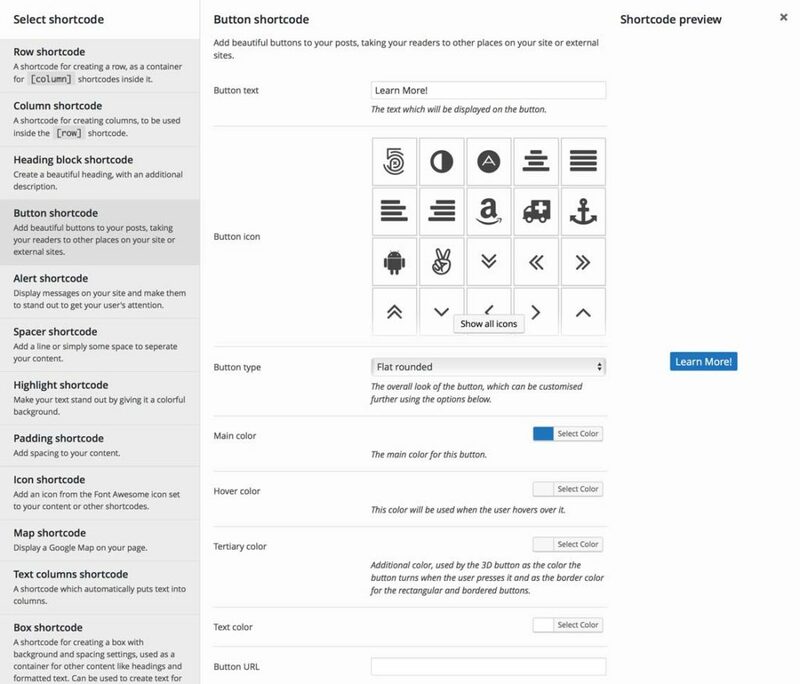 WPlook Shortcodes is an amazing plugin that allows you to manipulate the content of your website faster and easier using a plethora of Shortcodes. It is compatible with any theme and requires no programming skills to use. It comes with a bunch of useful Shortcodes which you can use to create complex and best possible posts. Demo | Download WPlook | More Information…! In other words, it gives you complete power to create amazing content and display the information in a more advanced way. If you are looking to make your site unique and more attractive with a modern look, then WPlook Shortcodes is one plugin that you will love. Perhaps the most compelling reason to choose WPlook themes is that they are usually updated very frequently. WordPress content management system (CMS) is always evolving and as such, having a theme that is updated regularly to fix unforeseen issues is vital. While performing updates might feel a little complicated, WPlook makes this process very easy. Everything is integrated and whenever a new version or updates are released, you just click the update button and you are done. The updates ensure that your themes and plugins function effectively without any problems. Keeping your site safe from anyone that might want to take it down or exploit loopholes for malicious reasons is of paramount importance when it comes to selecting WordPress themes. WPlook has taken great steps to secure their themes by following all WordPress security best practices. Just recently, they released WordPress 4.6.1, a security release built to address security issues in the previous WordPress versions including WordPress 4.6. This new release fixes two vulnerabilities, that is, a cross-site scripting vulnerability and a path traversal vulnerability, along with 15 bugs identified in the 4.6 version. WPlook is perhaps one of the most trustworthy WordPress themes provider as they offer the best support services to all their clients. They have a team of dedicated support staff that offer quick and professional support. With a satisfaction rate of 100%, you can be sure that WPlook will handle all your queries immediately regardless of the type of problem you are facing. WPlook offers three packages, that is, Lifetime Access, Club Member and NonProfit packages. The Lifetime Access package gives you access to every WPlook WordPress theme and plugins with just one payment. 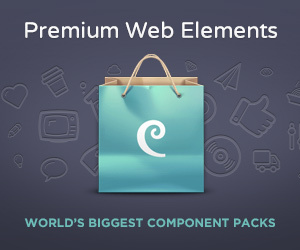 The package includes 13 themes and 2 plugins, and unlimited access to every new theme they release in the future. The Club Member package on the other hand is a subscription to all WPlook WordPress themes and plugins for Web Agencies, Web Designers and Web Developers. The package also includes 13 themes and 2 plugins, and premium support and updates as long as your subscription is active. The last package, NonProfit, is also a subscription package created for charity organisations, nonprofit associations, foundations, churches and political organisations. It gives you access to all WPlook NonProfit themes. The package includes only 3 WordPress themes, but you will have access to WPlook premium support and theme updates. Overall, WordPress themes and plugins from WPlook are undoubtedly of high quality. They are fast, well coded, responsive and include all the essential features you may need. 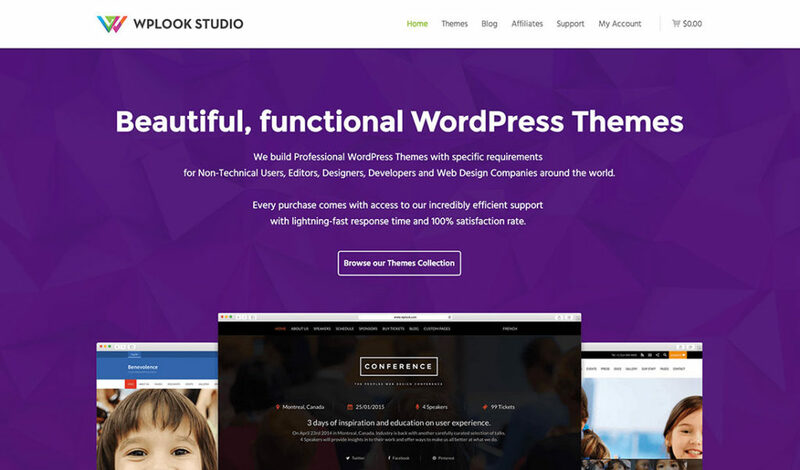 WPlook has a reputation to live up to and with their top quality themes you can create a beautiful and professional website that reflects the look and feel of your brand.